The key to keeping the tortillas from splitting while rolling is to use the freshest and best-quality corn tortillas you can find. Generally they should just include corn, salt, and maybe a touch of lime juice. I always have luck locating these at Mexican groceries or even at Trader Joe’s and recommend sourcing your tortillas there if you have one nearby. To make the sauce: Combine all the sauce ingredients in a saucepan and simmer over medium heat until the chile peppers are plump and rehydrated, about 20 minutes. Let cool and then process in a blender until very smooth. To make the enchiladas: Over medium-high heat, sauté the potatoes in olive oil with the salt until lightly golden brown, stirring often to prevent sticking. Remove from the heat and let cool briefly. Preheat the oven to 350°F (180°C, or gas mark 4) and lightly grease a 9 x 13-inch (23 x 33 cm) baking dish. 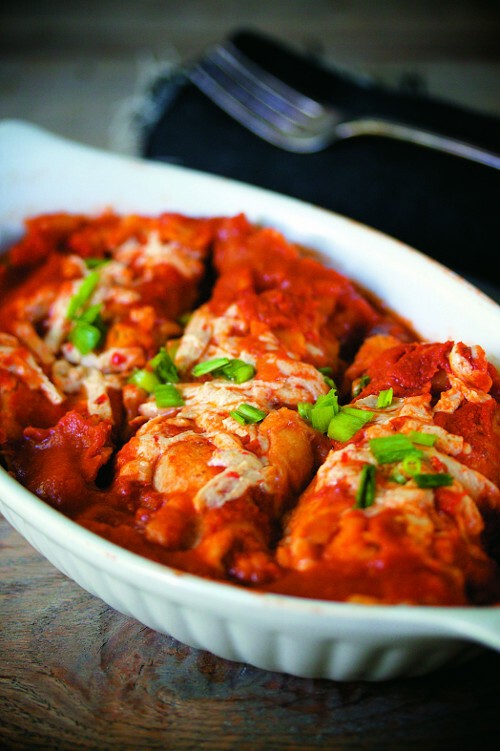 Pour about ½ cup (120 ml) of the enchilada sauce onto a large, rimmed plate or bowl. Have the rest of your ingredients, plus a large clean plate, lined up to assemble the enchiladas. Dip one corn tortilla into the sauce, ensuring both front and back are completely covered with sauce. Transfer the single tortilla to a clean plate and fill with about 2 tablespoons (28 g) each of cooked potatoes, black beans, and cheese. Roll up to close and place in the baking dish seam side down. Repeat until all the tortillas are dipped, filled, and rolled, tucking each enchilada snugly into the baking dish. The proximity of the enchiladas should be enough to keep them from unrolling. Cover the enchiladas with the remaining sauce and sprinkle with any remaining cheese, if desired. Bake, uncovered, for about 20 minutes or until the tortillas become slightly crispy on top. Serve hot. Per serving: 236 calories; 6 g fat; 8 g protein; 40 g carbohydrate; 6 g dietary fiber; 0 mg cholesterol.